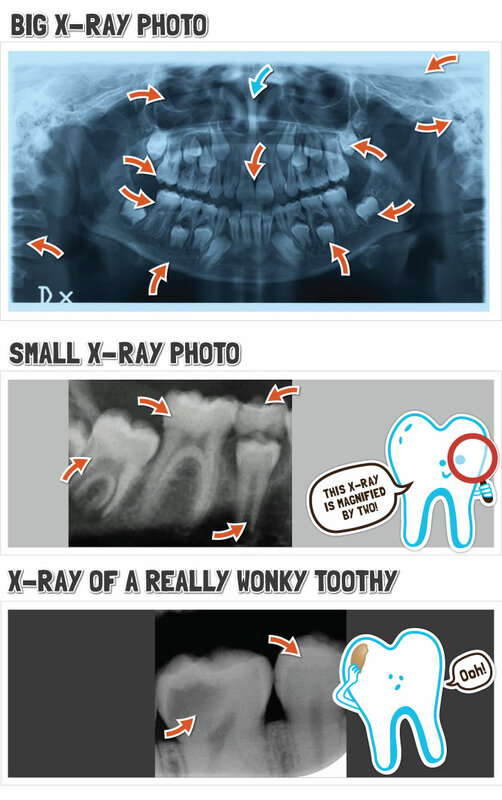 What are X-Ray Pictures ? The Dentist might take Cool Pictures like this of YOU!! There are three X-Ray "Skeleton Pictures" to look at below. As You can guess from looking at these Skeleton Pictures, X-Ray photos are very useful things for Dentists and Tooth Scientists. 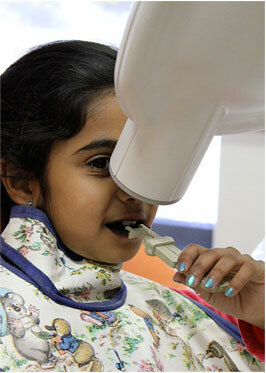 Not only can they Look Under Your Skin, they can also See Inside Your Toothys and tell how Happy they are!! the bottom of this page – can you find it? This Toothy is just fine because it doesn't have a Dark Patch at the Top!! 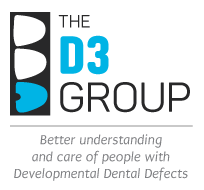 This is a 6-year Molar with a Bad Pothole that has turned into Decay. It shows up as a Dark Patch on the X-Ray Photo, because lots of Tooth Bricks are Missing. This Toothy needs a Shiny Crown or a Filling. What happens when I get a small X-Ray? 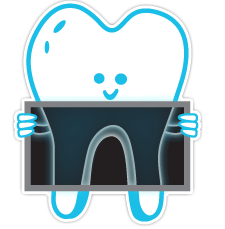 For the Small X-Ray Photos, you sit in the Dental Chair and wear a Special Apron that feels a bit heavy. 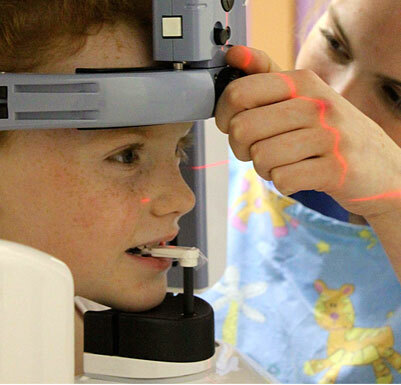 Once the X-Ray Film is carefully placed inside your mouth (the Dentist will ask you to bite on it, to hold it still), the X-Ray Camera is lined up carefully beside your nose or cheek. If you keep perfectly still, it will take only a second or two before you hear the Camera go click. 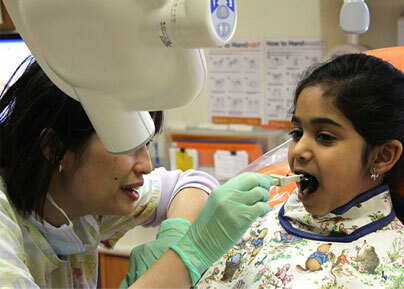 Soon afterwards, the Dentist will be able to see your Toothy Picture (and maybe you can see it too, if you ask). What happens when I get a big X-Ray? 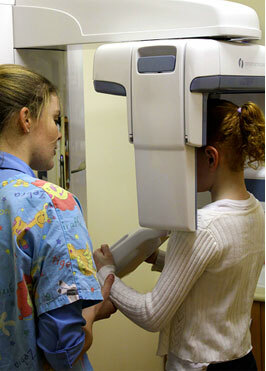 For the Big X-Ray Photos, you might need to stand up and put your head in a special holder to make sure it is in the right place. Sometimes you might also need to bite on a little handle, or rest your chin on a small plate. When everything is set, and if you are keeping nice and still, the Camera starts making a soft whirring sound. At first it looks into one of your ears, then it moves round to the front, then it keeps going around till it gets to your other ear. That is why you can see Ear Holes and Eye Holes in the Big Photo above!! Remember it is really important to keep very still the whole time otherwise your X-Ray Photo will be blurry. In the Big X-Ray photo, can you guess what the Blue Arrow points at? Hint: it's something smelly! !